I started this manicure out with a base of SinfulShine Koko-Nuts, swatches of which are further down in this post. 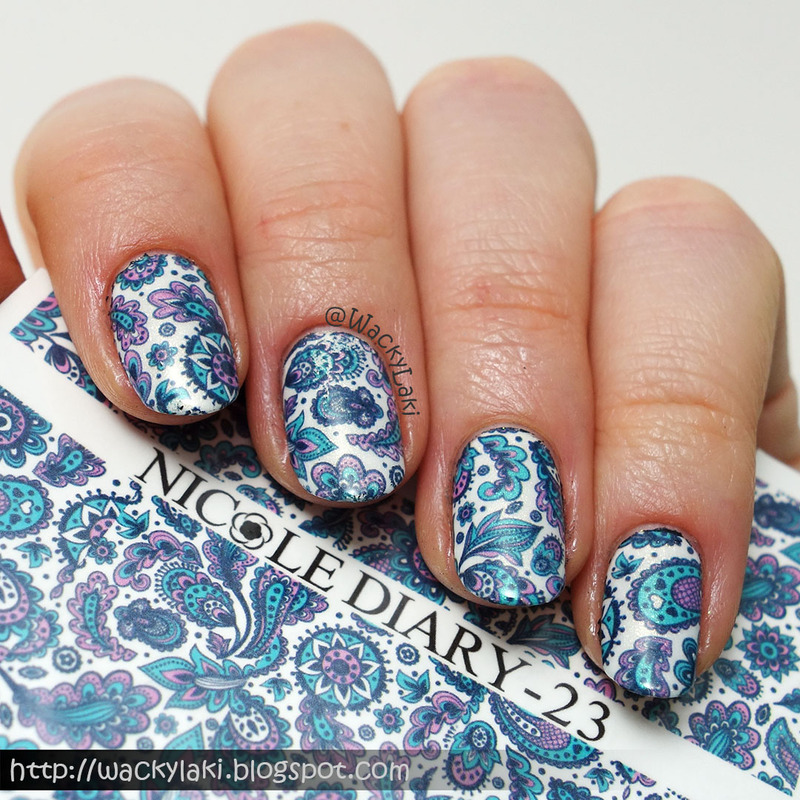 The paisley pattern comes from Nicole Diary-23 water decals. As you can see, these decals are a great size and large enough for full coverage of all the nails with room to spare. 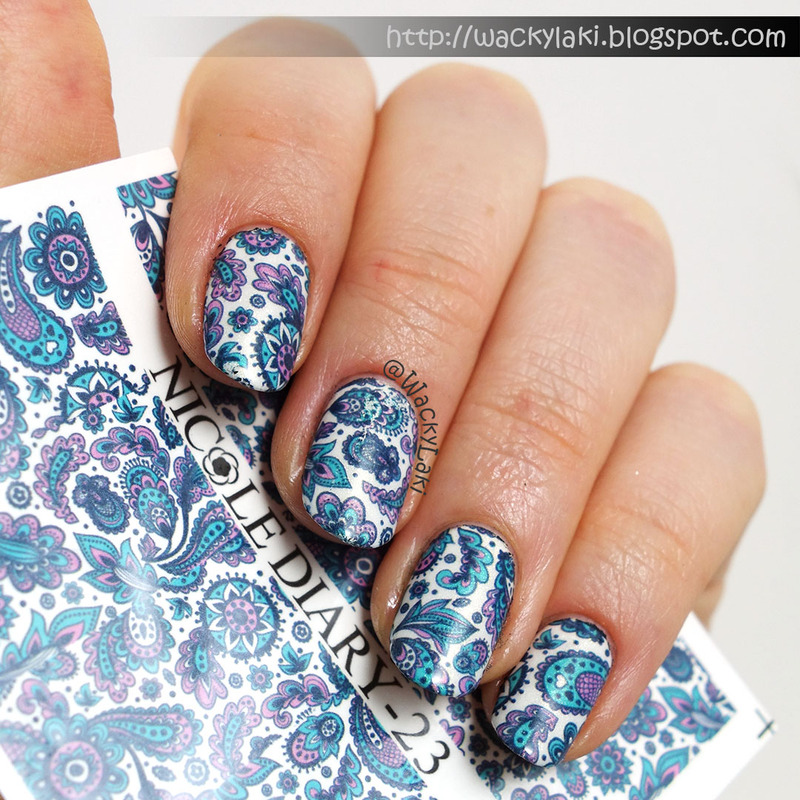 They are easy to use and contour very nicely to the nail, definitely making it a very quick mani. I love the bit of sparkle that shows through under the decals which are transparent. They can be used over any base polish color, although I find that they look best over very light shades and sparkle is always welcome. The pattern itself is also sheer and when layering over darker shades, it darkens the pattern so the colors aren't quite as vibrant and beautiful as they are over lighter shades. SinfulShine Koko-Nuts from the King Kyle line. A white cream with a golden shimmer. Let me apologize for the photos, but the camera (and I) freaked out a little over this color. The polish color somehow makes everything else seem gray in comparison even though it isn't. I attempted to brighten the photo, but it washed out the golden shimmer so I gave up and decided to show them as is. The shimmer in the photos is pretty accurate (as it appears to me), the white itself is slightly brighter. The formula is a bit thick, but I didn't have any difficulty applying two even coats for full coverage. Swatches here are with a top coat. It is very interesting color. I would definately add some design on it - some gorgeous abstract picture. It would be looking good with some glitters too ( like http://nailartstyle.com/top-60-glitter-acrylic-nails ).But your posts are cool anyway.